I do love days when the post delivers magical things. Let's face it, the post is usually stuff like bills and letters from charities that make you feel guilty you can't afford to support every good cause. But yesterday I got a lovely surprise that brought a smile to my face - a copy of the latest Magical Times. 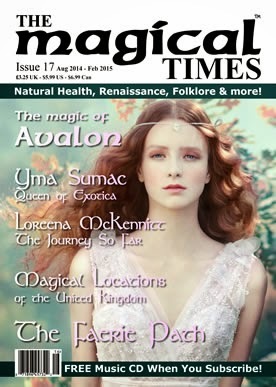 The Magical Times is probably my favourite British pagan magazine - it is beautiful to look at and has a great range of features. The new issue, number 17, covers goddesses, the Grail, how to develop intuition, hedge witchcraft and hedge riding, magical locations in Britain, sacred geometry, features on music, lots of faery art and, erm, how to count sheep and why doing so is connected to paganism. I've only skimmed over my copy so far - I'm looking forward to reading it and will pop it in my bag for the train journey to Seriously Spooked this weekend. I write articles for him...lovely guy and great magazine.